Excited because in a few hours, I'll be driving to the airport to pick up my husband, who has been in Paris for most of this week. (My LSS is near the airport, so there may be a stop on the way....). Mike and I often joke about "one upping one another," as if our relationship was a contest, so I thought I'd have this card waiting for him as a surprise when he gets home. 1. 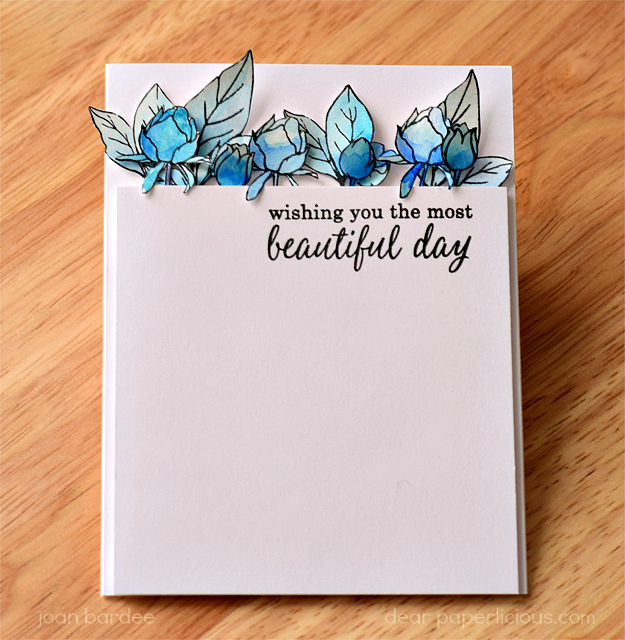 Made patterned paper by repeatedly stamping with a small petal stamp from the Garden in Bloom set (Stampin Up). The red and pink inks are from Altenew (love them). 2. Added a sentiment from Love You So (Essentials by Ellen) and a flower (Wildflower) and die (Floral and Flutter) from Concord & 9th. 3. Sewed the die to the patterned paper by hand because the sewing machine I bought 2 weeks ago is still in the box. My mom, who had to quit school in 8th grade to help support her family, was such a fantastic seamstress, but would never teach me to sew. She used to tell me that she "wanted me to have a life where I could afford to just walk in a store and buy a dress off the rack." Well, I got that life, but I want to learn to sew! 4. Adhered the strip to a Soft Stone (Papertrey) card. Because the flower is way over the edge, I won't put this in an envelope, but the envelope looks good in the pictures! Sometimes I try and sound professional on this blog but I can't pull it off for long. 1. Blended inks over Hero Arts Delicate Petals Stencil. 2. Blended same inks over scrap paper and stamped sentiment from Hero Arts Many Everyday Messages. 5. Added some clear drops. So easy!!! I love stamping! Three days ago I started to make a card. All I wanted was a decent looking card to send to someone who recently had surgery. 1. Stamp and mask hydrangeas. Should be ok, but every sentiment I tried looks too busy against the flowers. 2. 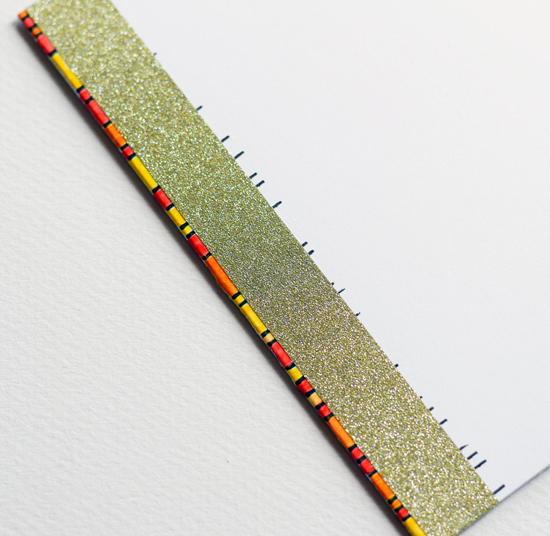 Paint stripes on top of card. Such a cool idea, except it looked awful. (Mike: "Is that some experiment?") I wonder if I should take art lessons. 3. Die cut balloon animals in different colors. Colors were terrible together and the whole concept not related to purpose of card. 4. Stamp rose stem flower using Distress Stains. Not bad and could send to my friend, except it was identical to another card I blogged about, and therefore, made no sense to blog about it again. I mean, is there any point in making a card if it isn't going on the blog? 5. 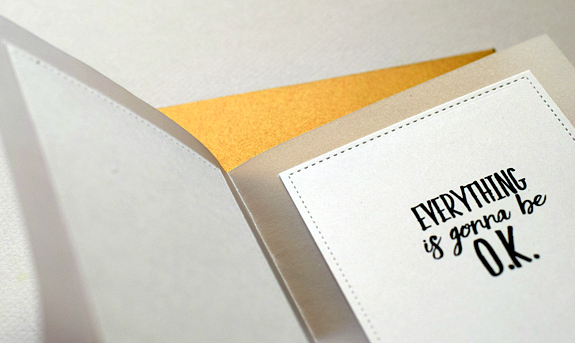 How about stamping a background and adding a sentiment in vellum? Apparently not. 6. This shouldn't be this hard. Remember the Hero Arts Delicate Petals stencil, which I found immediately because it was in a file folder marked "stencils". Excellent omen. Let's try using it. Blend ink over the stencil. Shockingly, looks good the first time. 7. Add sentiment stamped on vellum because I refuse to give up the vellum idea, and die cut with oval die. No. 8. 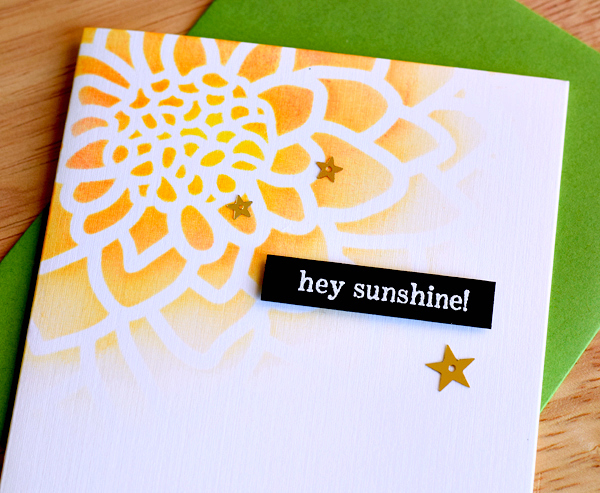 Stamp sentiment on white cardstock and die cut with circle die. No. 9. Blend inks on scrap cardstock and stamped in black. Ok. Except for weird black thing hanging from the "h". 10. Stamp again and sentiment now clear. 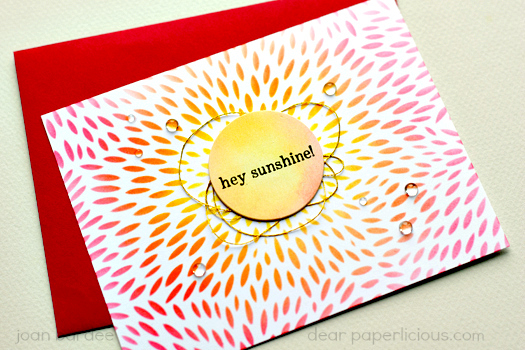 Die cut again with circle die. 11. Place on card. Have lost ability to judge, but it appears to need something. NO -- NOT THE DREADED THREAD NEST. It always a disaster when I try and be trendy, but I've run out of ideas. Try it with yellow thread. No. Try it with gold thread. I DON'T CARE ANYMORE. Just glue the d*** thing on the card. 12. Adhere clear drops because other people do and it seems to need something. Decide to sell all supplies and take up crochet. Except I can't crochet. 13. Just get it in the mail. MOOD WHEN DONE -- Hey, it's a hobby!! Tried out a new (to me) product -- Liquidex Bright Gold Iridescent Ink. It is very fluid -- much thinner than paint. You can mix it with acrylic paint or just play around with it as I did. It comes in a bottle with an eyedropper. Paid about $5 for it at a local art store. You can also find it online at a variety of places should you feel the need to buy one.more.thing. 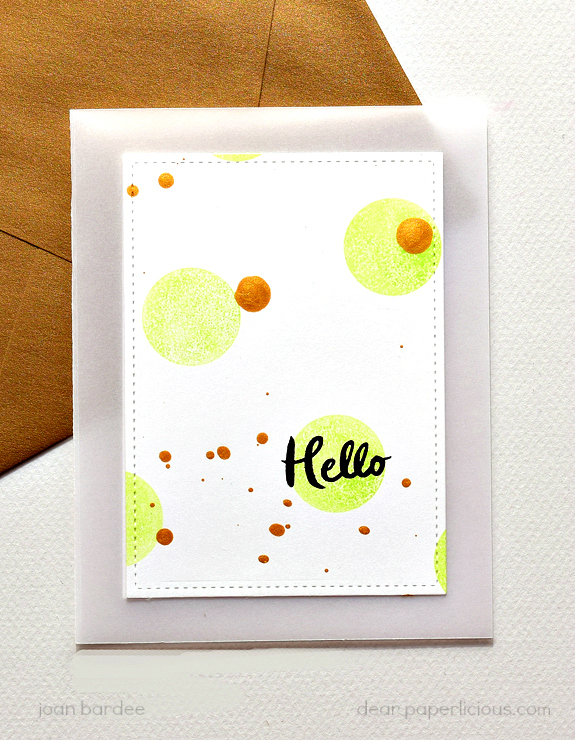 Used the eyedropper to flick gold spots over the white layer, which I had stamped with Bokeh Dots and Hello Gorgeous, both from the Essentials by Ellen stamp line, designed by Julie Ebersole. It dries within a few minutes. I was just goofing around to see what would happen and I ended up liking it enough to use it on this card. Die cut 3 more white layers so that the layers on the top of the card and the inside right of the card are backed up on the other side and the adhesive is hidden. A new Online Card Class starts tomorrow and it is on "Clear and Sheer," a topic that intrigues me. I'm taking it and hope to learn some new uses for vellum and other clear products. MOOD WHEN DONE = On the fence about this product. Is it a must have? No. But it was fun to experiment. And fun is good. Revisiting a fun little set, Happy Mail, by Right at Home. Paired it with a stitch heart die by Papertrey Ink and a coordinating envelope. 1. Trim top layer and die cut the heart. The die only cuts the dots in a heart shape. 3. Mask and stamp flowers. 4. 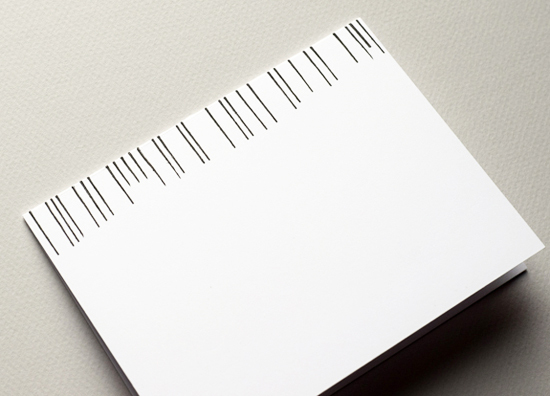 Adhere top layer to card with dimensional foam tape. 5. Die cut envelope liner (mine is from Clear and Simple Stamps) from patterned paper (this is from Stampin Up) and adhere as shown below. 6. 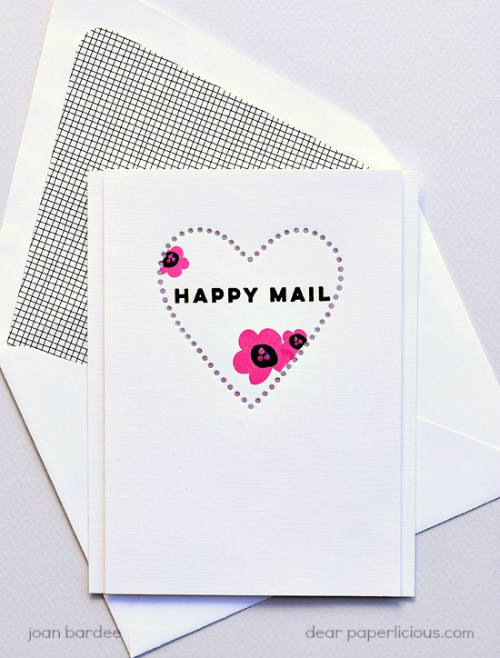 Put it in the mail and make someone smile. 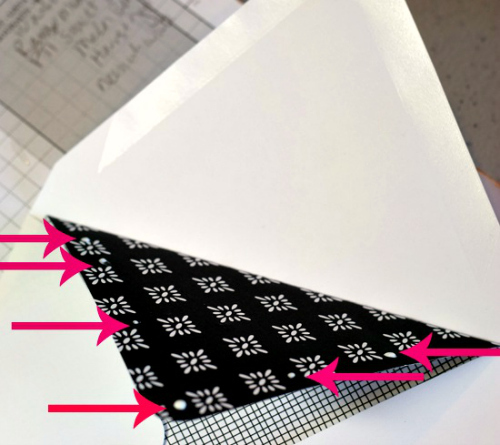 Tip for lining envelopes. Much easier to insert the liner without any adhesive. Then fold down the top part of the liner on the score line, apply adhesive (see the pink arrows), fold back and adhere. Julia, I've emailed you and you will be hearing directly from Ellen Hutson LLC. Congratulations! To start this story at the beginning, please go here and follow the links. And thanks for reading! Remember: this is fiction. No laws, tax advice, stamp advice, or design ideas have any validity! The next morning, Beth and I met for breakfast at 7:30. Beth was just a few pounds short of chunky. She was wearing khakis and a cute smock top embroidered with little pink flowers. Her dark hair was in a bob and she had the clearest blue eyes. She seemed friendly. I liked her. Beth ordered first. Waffles and a hot chocolate. With whipped cream. I liked her even more. Nothing worse than eating breakfast with "I'll have an egg white omelet with black coffee please." I wondered where she lived, was she married? Would they like the Outer Banks? Who needed Gina and her family? The fireflies were starting to twinkle again. "Listen," I said. I emailed Andy Farther, my lawyer, last night and it's going to cost about 25 thousand to get the patent and put together a business. Here's the email exchange." I handed her my phone. I didn't want to hide anything from her. Beth read the emails and then said, "Well, I'm not surprised." I asked her, "How much have you invested so far?" "Look, I know I'm moving fast. It's just that I think this really is a goldmine and after today we are going to go our separate ways. If you want to go it alone, I will back off. Why don't I tell you a little bit about myself?" Beth smiled. "That would be nice." Ok, I'm married and an almost stay at home mom. I say almost because lately I have been looking to get into a business of some sort. My husband's name is John and he's a lawyer. But don't hold that against me! He's nice! We live in Northern Virginia, right outside Washington DC. I have 2 kids, a boy and a girl. Buffy is 16 and Garrett is 11. 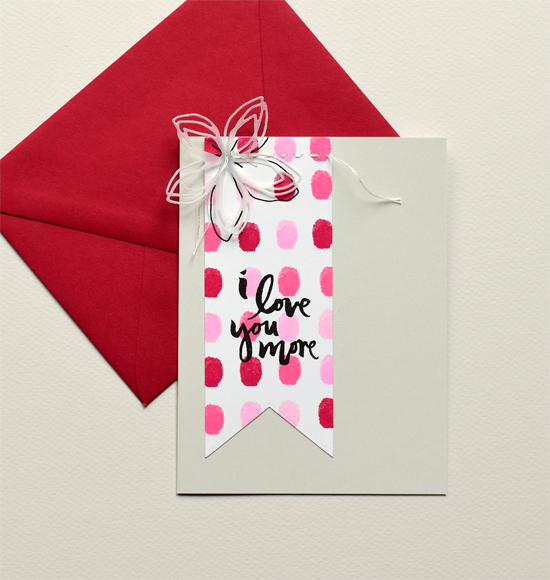 I was a Get Down With Stampin demo for a few months and had such high sales that Get Down flew me up to their headquarters in Vermont to pick my brain." Beth looked interested. "Wow, I am impressed. Are you still a demo?" "No," I said. "I gave that up. I decided that I wanted to spread my wings a bit farther. Now tell me a little about yourself." No need to get into that story. Beth explained, "I'm also married. My husband's name is Ted and he works for Hershey." "Wow, so you live in Pennsylvania?" "Yes, not all that far from you. 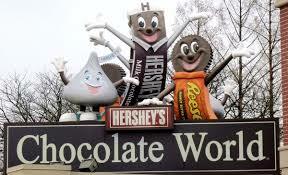 We live right in Hershey." "Yikes," I said. "That's one of our favorite places to visit. We've been to Hershey Park and the chocolate factory and store a thousand times! It's the happiest place on earth!" Beth laughed. "Yes, it's a great place to raise a family. We have 3 kids. Ted junior is 14, Michael is 10, and Ellen is 8. I also used to be a Get Down demo, but I left that a few years ago. The kids were small and just needed so much of my time. Now that they are in school, I have more time to devote to growing my own business." "That's awesome," I said. "If you are ok with it, why don't you tell me a bit about Clearly Superior? I'm dying to know how you came up with the idea of clear stamps. It's genius." "Well, it's kind of a funny story. I volunteer at my kids' school and I offered to come up with an arts and crafts project for a booth at a PTA fun day fundraiser. I decided to have them make paper place mats. I didn't want the kids using my real stamps so I had them stamp circles with the rim of a clear plastic glass. I watched them and some of them were very carefully placing the circles so that they would form a pretty pattern. A light bulb went off. They could see through the glass and knew exactly where to place the rim. Wouldn't it be great if all stamps were clear so that we could see where to place them?" "Beth, OMG! You're a genius. Seriously. This is brilliant!" Beth laughed. "Well, I'm glad you think so. It took my husband a while to come around. I had to do a lot of research and trial and error before I found the right materials to use." "Yup," I said. "Sometimes the husbands are the last to see our brilliance. I totally understand. I hired a valet and bought an ice sculpture for a GDWS workshop and my husband flipped." "No you did not!," Beth shrieked. "Oh yes I did, and I sold 11 thousand dollars worth of stamps that night." Beth put down her fork and said, "You know what? I know this is crazy, but I really like you. I think we could work together. To answer your earlier question, so far I've invested about 15 thousand in Clearly Superior. Some of that is packaging, but most of it is for the stamps themselves." Wow, I thought. She likes me! She likes me! I have a new best friend! 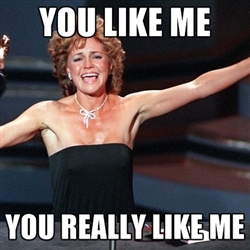 I exclaimed, "I like you too! Oh, I'm so excited!! Do you design the stamps yourself?" "Yes. I mean I have 5 sets. One is from copyright-free art I found on the internet. One is a sentiment set and 3 are ones I drew myself. That flower set you used yesterday? I drew that." "Wow, it's awesome. You drew those? What kind of flower was that? Cherry blossoms? You have a lot of talent!" "Well, thank you. And, yes, those are cherry blossoms. I've always had a flair for design. I have a degree in graphic design." "That's Almost Always Artichoke!" I said. 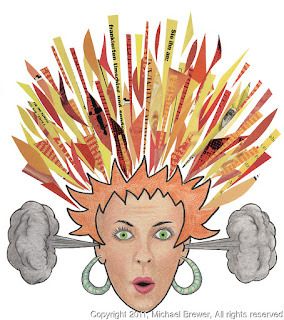 "No wonder your stamp sets are so fantastic. My degree is in journalism. I've always had a way with words, but I'm not that artistic." By then I had finished my Pigs in a Blanket. Whoever thought of wrapping little sausages in pancakes and dousing them with syrup was a genius. It was probably some cook at IHOP who got paid minimum wage while the corporate fat cats counted their millions. I'm telling you. You have to fight for every dime. But, it was getting late and we needed to move this along. So I said to Beth, "It's almost 11:30 in the east. Do you want me to call my lawyer and see what he says?" There were a lot of reasons why not, as in Andy charged by the minute. "Beth, Andy charges by the minute. As a gesture of good will, I'll pay for the entire cost of this conversation. Who knows where it will lead, but since you've already invested a lot in the company, I'll pay for this just to see if it is worth pursuing." Hey, I could write it off, right? Beth responded. "He charges by the minute? I should have gone to law school! I appreciate that, M."
"Beth, I want to make clear that I am M's attorney, not yours. Before you enter into any partnership with M, you'll need to get your own attorney to review the papers unless the both of you agree to hire me." UGH. Mr. Ethical. Already the legal kiss of death language. Just get to the good stuff. Beth said, "Thank you. I appreciate knowing that. For now, I'll just listen and then decide." Andy said, "Fair enough." He went on to explain the differences between a design patent and a utility patent. There was a lot of blah blah blah. But then he said, "The first thing we'd need to do is do a search to see if anyone else has already filed a patent to protect this same concept. If so, you can't make a dime using this concept." Beth and I looked at each other. I could tell she was worried. So was I.
Beth said, "Ok, I've heard enough. I want to go forward. If M agrees, we'll form a partnership and hire you to handle it. M's agreed to pay for the expenses of the patent and the partnership." We spent the rest of they day roaming through CHA, getting to know each other and walking the floor to see if we could see any other clear stamps. NONE! So far it looked like we were safe. We took down Beth's booth and hoped no one had paid any attention to it. We left CHA, agreeing to talk with our husbands before finalizing a deal. I kind of resented having to do that. John didn't call me up to discuss his business, but I was determined to make up for Vermont and the MAN, so I discussed it with John when I got back. John was, surprisingly, ok with the idea. I explained that I had committed to only $25K and that all of it would come from my craft account. Apparently, Beth's husband Ted was good with it as well because, after a lot of back and forth, and a few meetings between Beth and me and Andy, we agreed to the following. 1. We'd form a partnership or a limited liability corporation, name to be decided. 2. Beth would give her design idea, or as Andy called, intellectual property, and the current inventory to the company. 3. I would pay the first $25K in expenses. After that we would split all expenses and profits, 50/50. 4. We agreed not to take a salary at first but to put all profits back into the business for the first 2 years. 5. We took out disability and life insurance policies protecting each of us in case something horrible happened to the other. Andy was fantastic and worth every dime. It took a few months, but when it was done, Andy reported that no one else had filed for a patent! We were the first one to do so. Andy suggested we look into licensing the idea -- get other companies, like GDWS, to pay us a royalty for every clear stamp set we sold. That way we could just sit back and let the money roll in. It was mighty tempting, but Beth and I decided to create our own company that would start with stamps, but eventually expand to other products. We decided to name our company "Beautiful" and start by introducing Beth's clear cherry blossom set and a set of sentiments. We would limit our sales to the internet and concentrate on well, beautiful designs. No Santas playing the guitar. Just classic and gorgeous images and sentiments. Not many craft companies sold only on the internet, but we didn't want to pay a retailer or a bunch of demos a cut of our profits. At my suggestion, Beth had designed a simpler, and more modern and colorful packaging with a gorgeous Cherry Blossom logo and a bunch of samples featuring the two sets. Clearly Superior was no more; Beautiful was the future. We both ended up investing a bit more than we planned, but once we were in we wanted to do it right. Besides, the tax benefits were fantastic. We planned to go public on September 1st. We had enough inventory to sell 500 of each set. I was in charge of marketing and getting the orders out. Beth was in charge of the designs, ordering materials and production. We had a website. It was simple but could process orders. It featured our logo and tag line: "Beautiful is Clearly Superior." That was my idea and if I say so myself, genius. Beth's samples were fantastic and featured on the front page of the store. At the last minute we got nervous and decided to place a banner ad on Splitcoast. It would pop up every 15 minutes for a 24 hour period starting on September 1st. I decided to create a fake user profile on Splitcoast and start talking about the company to stir up some excitement. Hey, only my name was fake; my excitement was real! On September 1, Beth and I each sat by our computers and waited for the orders to come pouring in. Ellen is generously offering a $50 gift certificate to her shop for one person who comments here on my blog on this post. I'd love to know what you think about my project! The deadline for comments is midnight eastern time April 19th. Please note: If you want to be considered for the prize, I'll need your name and email to send to the folks at Ellen Hutson so please make sure I can contact you. Thank you. MOOD WHEN DONE = Grateful to Ellen for being so nice! 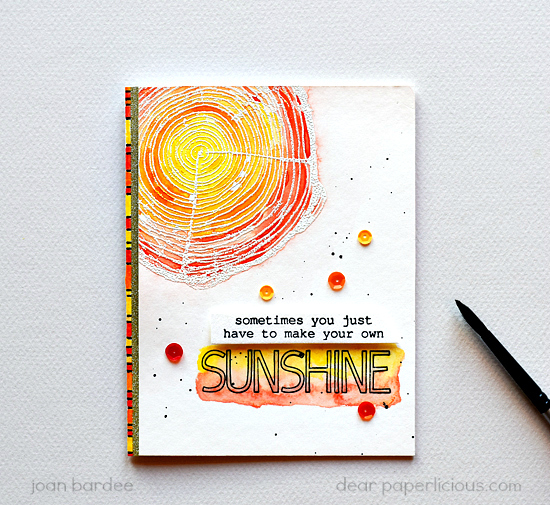 As the sentiment says, sometimes you just have to make your own sunshine. Took Concord & 9th's awesome Tree Ring and turned it into a sun. 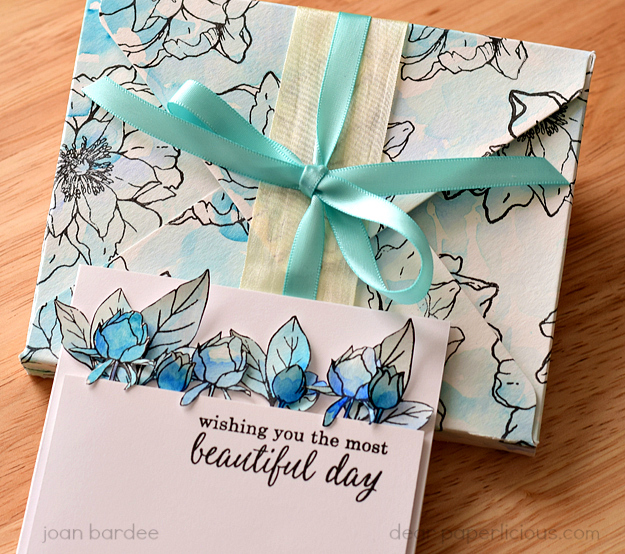 Added Julie Ebersole designed Essentials by Ellen All Inside sentiment and we are having fun. 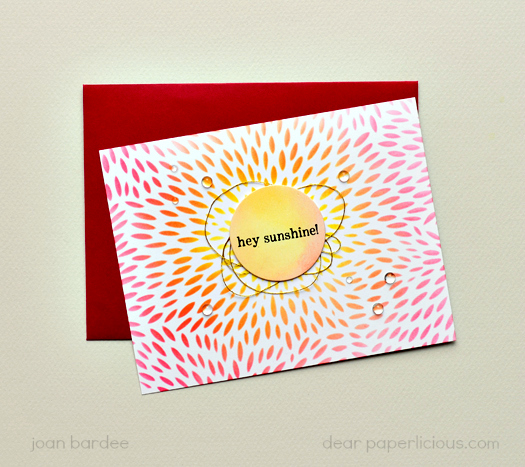 Watercolored the "sun." Wanted some coordinating paper on the side of the card so I made my own using a little stamp from Concord & 9th's Birdie Banners. Using very little water, I painted the stripes on the side of the base card using the same Kuretake Gansai Tambi watercolors that I used to color the sun. Added some gold glitter tape for some fun (I'm not sure what brand my tape is but I've linked to something similar). Tomorrow I'll be back with a "very special" post and a nice giveaway. Actually, I hate teases but I'm just feeling it. Before we talk card, can we talk about how fantastic it is to clean up and organize? I spent the past few days doing exactly that, and finally found a spot for all those little things that have been messing me up -- pieces in progress, die cuts, stencils, etc. I just created file folders for them, and voila! Peace and happiness. 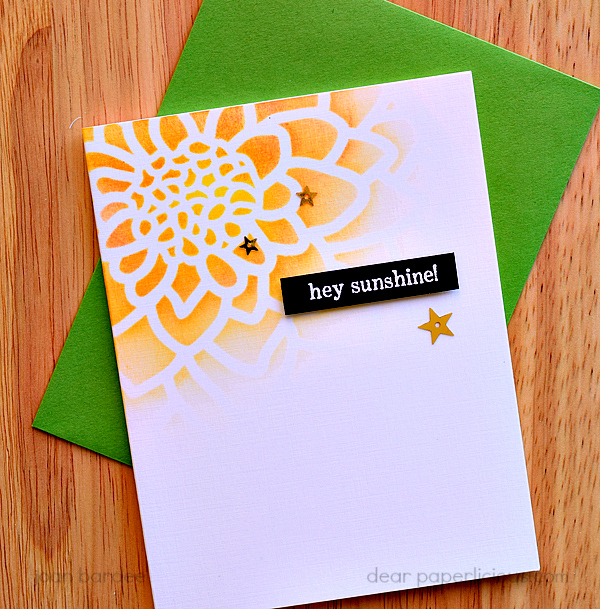 Now that I can find my stencils, I used one to make this fun card. It's a large stencil from Hero Arts called Large Flower Stencil (6.5' x 5.25'). Just placed it in the corner of this white linen card, and blended 3 shades of ink, yellow, light orange, and a darker orange. Added a sentiment from Hero Arts Many Everyday Messages and a few star sequins. And then I put everything back where it belongs. Edited to Add: Please note: This kit has sold out. 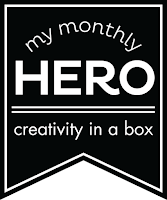 Today I am honored to share a card and envelope box made with some of the products in the fabulous April My Monthly Hero Kit that Hero Arts is releasing today. It's a limited edition set -- once it's gone, it's gone. It's a beautiful kit at a rocking price ($29.99)! 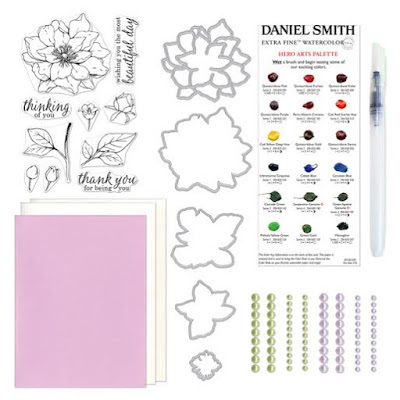 There are 3 optional add-on items -- a Happy Mother's Day stamp set, Happy Mother's Day Frame Cuts coordinating dies, and the DANIEL SMITH watercolor paints in 15ml tubes - 18 colors in all, the colors used on the Hero Arts Palette dot sheet. 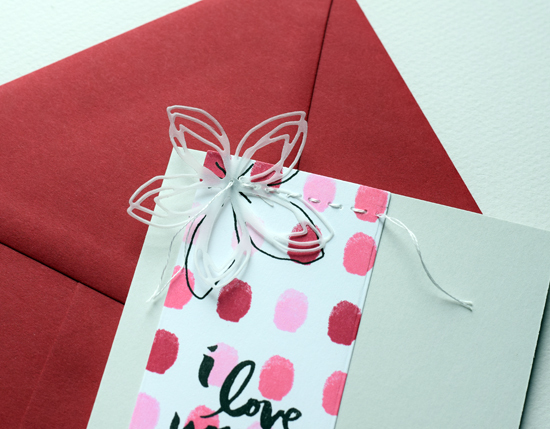 The dots contain enough hardened watercolor (just touch with a damp brush) for several cards. The colors are fantastic and they blend beautifully. This kit is great for folks with watercoloring expertise, but even better for folks like me who are faking it! I just love this row of tucked in flowers and leaves. Stamped a sheet of the smaller flowers and leaves on watercolor paper and brushed them with Ultramarine Turquoise and Cobalt Blue Daniel Smith paint dots. Those colors are amazing. Peeled off (carefully!) the top layer of the watercolor paper so that the flowers and leaves are thin and delicate. Cut them out by hand. 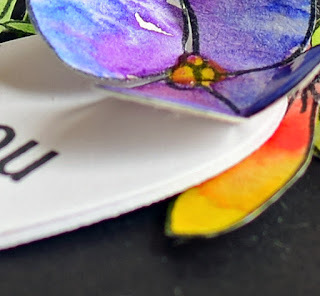 I didn't have the dies, but if you want to peel off a layer of your watercolor paper, please do it before you die cut. Once those babies go through your machine, you won't get that top layer off without ruining your work ... trust me. 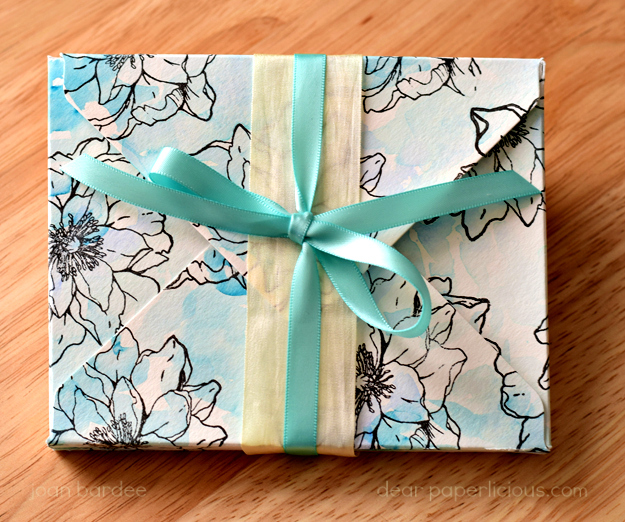 Didn't want to ruin those delicate flowers and leaves by smooshing them into a regular envelope, so I made an envelope box using the WRMK Envelope Punch Board and the directions provided by Jennifer McGuire. Stamped a 9x9 piece of watercolor paper with the gorgeous large flower in the set and brushed the same Daniel Smith colors that I used on the card. Let dry, make the box, and voila! There's a line up of seriously talented women (I snuck in!) who are on this blog hop, and a kit will be awarded to one commenter across the blogs, so get out of here and check out how these ladies rocked this kit. Or just go buy the kit (edited to add, the kit has sold out, hey I warned you) before it sells out and then get back on the hop. 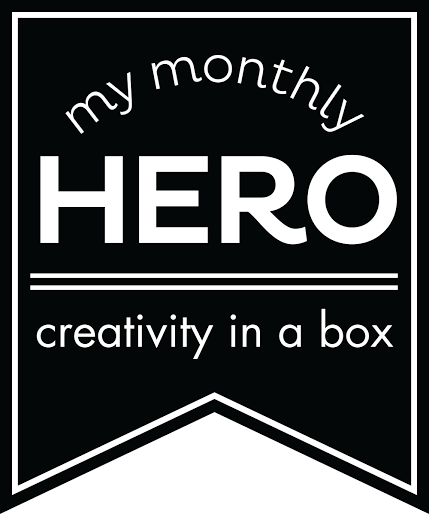 I recently received a cube of the Hero Arts Intense Black ink as part of the March My Monthly Hero kit. The word "intense" had me worried. Does this ink study too hard? ; does it worry about the number of followers it has on Instagram? Then I thought that maybe there was something wrong with my other black inks. Maybe they should be intense. AAACK. So, I HAD to compare the Hero Arts Intense Black with my other black inks. A few things before the comparison. First, I did not pay for the Hero Arts ink -- Hero Arts kindly sent me the March My Monthly Hero kit along with some other products. Hero Arts did not ask me to do this review and doesn't know I am doing it. Second, as far as I'm concerned, finding the "best" black ink is like finding the best presidential candidate. Scratch that, it's easier to find the best black ink. Two stampers can use the exact same ink pad with the same cardstock and stamp and get different results. Sometimes it's just the way we stamp. Also, ink pads themselves vary. 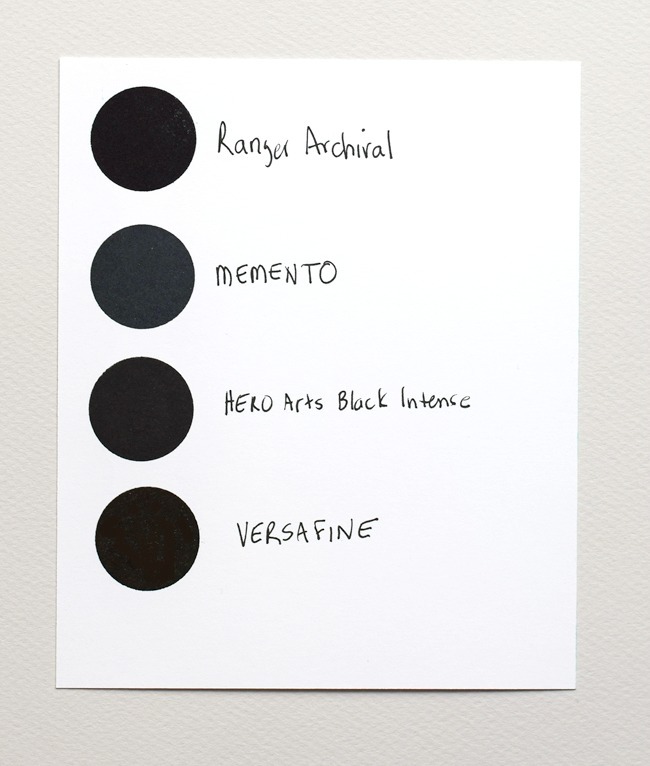 My friend Susan Raihala loves Memento Luxe ink, but I tried it and got awful results. I think I had an overinked pad, or maybe I just press differently, or perhaps Susan is wrong mistaken had too much wine. That said, here are my results. For this test, each ink pad was either new or recently reinked. I stamped each image twice using the MISTI onto Neenah Solar White cardstock. I also stamped a line image with each ink. Ranger Archival Black -- The crispest image (edges not ragged), very black. The worst coverage on solid stamps. 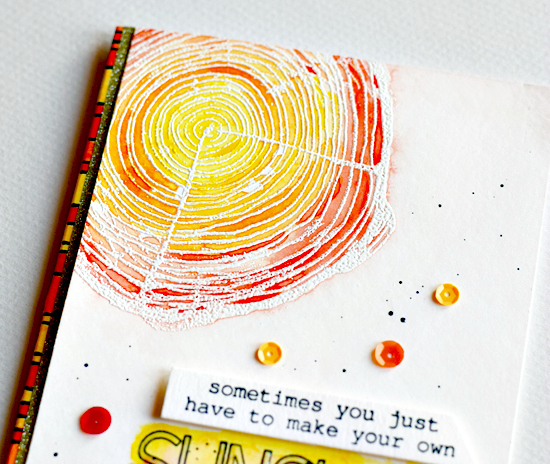 Even stamping twice with the MISTI, there are some tiny white spots on the solid circle. Waterproof. Cannot use alcohol markers, such as Copics. Hard to clean and stains. Memento Tuxedo -- Least crisp. Ok coverage. Looks dark gray when compared to all others. Can use with alcohol markers, such as Copics. Easiest to clean. Does not stain. Hero Arts Intense Black -- Crisp. Excellent coverage. True black, but slightly less black than Ranger and Versafine. Can use with alcohol markers and is waterproof (Hero Arts does not claim it is waterproof in the description on its website, but I watercolored with it with no bleeding.) Easy to clean and does not stain. Versafine Onyx -- Crisp. Excellent coverage. Waterproof if you let it sit for a few minutes, can emboss, true black. Can not use with alcohol markers such as Copic. The first 20 times I used this ink pad I got awful messy results. Then, voila, the ink pad came out of detention, got its act together, and I am very happy with it. 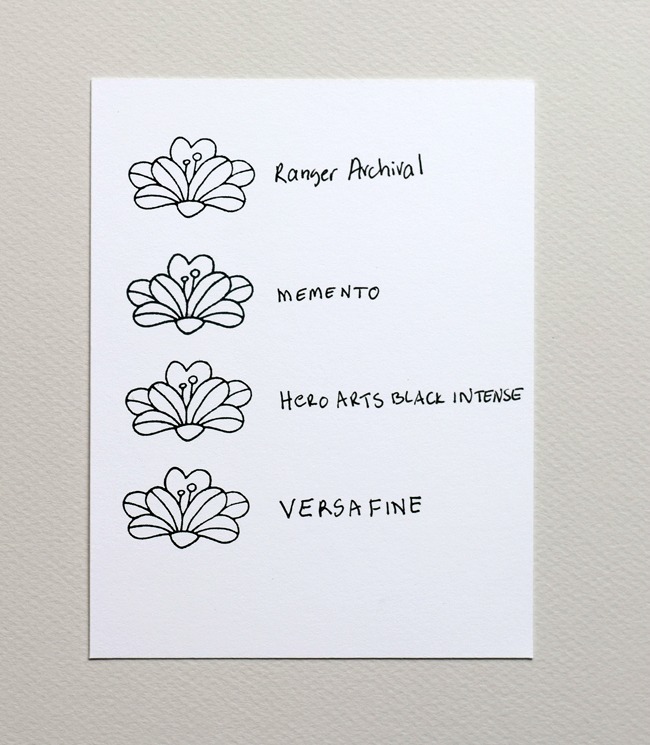 Not as easy to clean as Hero Arts or Memento because Versafine is a pigment ink. Does not stain if all ink is removed. MOOD WHEN DONE = Will use Hero Arts Intense Black instead of Memento when using Copics. Will use Versafine for everything else unless I can't find it under the piles, in which case I'll use Hero Arts. Would love to know your thoughts on black inks!